It's already January 28, but this blog just started so it isn't too late to write about my favorite album of 2007, A Kaleidoscope of Egos by Chicago's own May or May Not. I'll start by stating I have no idea why this CD is not plastered all over sites such as Pitchfork and in the music collection of every indie kid everywhere. It's proof that life is unfair. A little background: May or May Not is an indie pop unit that has been around since 2004 or so. I first found out about the band in 2005 when I saw them open for The dB's at House of Blues Chicago. 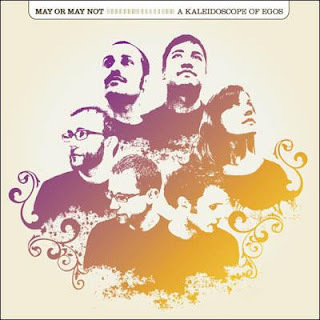 A Kaleidoscope of Egos is the band's second full-length release, following 2005's debut Colors Only Bees Can See and a four-track EP, Bike, released in 2006. The band's sophomore release upstages its debut with a set that is consistently strong and memorable. Each cut on Kaleidoscope has its own character, yet the album comes together nicely with the help of three brief interlude tracks. The CD kicks off to a strong start with a trio of driving songs - Self Charmed Man, Boots and Do the Disaster. This set allows each of the band's three lead vocalists - Zaid Maxwell, Amelia Styer and Steve Reidell - a chance at the helm. Boots marks the band's first lead vocal by Styer, and the result does not disappoint. Styer's girlish, almost dispassionate delivery meshes nicely with the song's cryptic lyrics and propulsive beat to create a gem. Do the Disaster, featuring a vocal by Reidell, is more straightforward, but just as enjoyable. It reflects expert pop craftsmanship, and is probably the most accessible song on the album. Luckily, the band leaves no room for filler, quickly offering up another highlight in Cinnamon Girls. This track features an irresistible 60s pop-inspired melody and Mrs. Robinson-like background vocals. The momentum continues with the quirky Garbage King, the manic Nameless and the psychedelic, epic Lavender Shell. It's not difficult to imagine Stuart Murdoch singing Marilyn Jones, a mellow, pretty ballad. It is followed by I Get By, another hook-filled number that is sort of like Maxwell's answer to Do the Disaster. Styer's second song, Oh, What a Spectacle, is as spectacular as her first. It has a keyboard-driven, new wave vibe that sends a jolt through its listener. It is a welcome surprise that sounds like it could have been a Blondie track circa 1979. Mt. Hopeless is more catchy guitar pop, and a fitting closer to this fantastic record. Its melody is upbeat, yet Reidell keeps things interesting with desperate lyrics that proclaim "We're at the end of our ropes" and ask "How long can we hang on at 100 miles an hour?" If A Kaleidoscope of Egos is a sign of what's to come, I hope May or May Not answers this question with "A really long time." This CD is essential for any fan of indie pop or power pop. Check out some tunes at May or May Not's Myspace page, linked below. If you like what you hear, click over to itunes or CD Baby, buy the CD and support a well-deserving band!